When you only want the best Dutch oven and the average just won’t do, where do you turn? Well, you turn to Le Creuset of course, and their Le Creuset Signature Enameled Cast-Iron 6.75 Quart Oval French Dutch Oven. This impressive looking product will not only turn heads but has the features to back up all of that confidence. So does this Dutch oven deliver on its promises? That’s what you are about to find out in our full in-depth review. In this article, we will be laying out all of this product’s main key features. We will also be tackling the pros and cons and getting a feel for what the customers really felt about this product, including any major and minor issues. So, if we had to make a quick decision on whether to purchase this product or not, then we would have to say, maybe. If we were just looking at the product features and build quality, then absolutely, it’s a must buy. However, at the current price of $360 on Amazon.com, it’s hard to fully recommend this product. I really like it, and I feel that you would be getting a superior Dutch oven. It’s just kind of a sticking point for me. So, we will continue to look at this product’s great features so you can more easily decide for yourself. 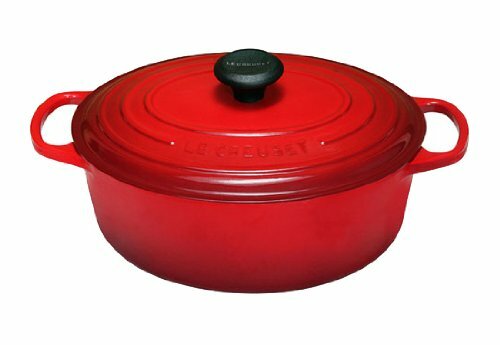 This Le Creuset Signature Enameled Cast-Iron 6.75 Quart Oval French Dutch Oven is no doubt, feature rich. High price aside, I truly believe this product would make a wonderful addition to any kitchen. The handles on this particular product are 45% larger than previous models. This will allow for a much more secure grip even when using bulky oven mitts. Its oval design will allow for larger meal preparation. Because it’s made from enamel coated cast iron, this Dutch oven has superior heat retention and heats up evenly. Le Creuset also made sure its sand-based color-enamel resisted wear, such as chipping, cracking, and flaking. It also resists damage from highly acidic foods such as wine and tomato-based food products. The enamel coating also allows for an even lighter piece of cookware that surpasses all other products in its category. Finally, this Dutch oven comes with a slip-resistant lid and the whole product can withstand temperatures up to 500 degrees Fahrenheit. As you can clearly see, the Le Creuset Signature Enameled Cast-Iron 6.75 Quart Oval French Dutch Oven is really in a league of its own when it comes to quality. This enameled Dutch oven received 4.8 out of 5 stars. Most who purchased were incredibly satisfied with both the aesthetics as well as the durability and quality. Most customers who rated this item highly had owned this product for 3 to 5 years and were still impressed. They liked the many color choices and the versatility offered with this Dutch oven as well. There was only one major issue reported out of the 46 customers who left a rating. We will get to that shortly. Now we will move to the pros section, followed by the cons. It’s rare for a product to have so little reported issues. It is definitely a testament to how much of a quality piece of cookware this product is. Customers who purchased this product would overwhelmingly recommend it to a family member or friend. The only real issue I see and a major barrier to entry for most is the price. If you do choose to pick this Dutch oven up, you can be sure that you will be pleasantly surprised with your new investment. In the end, only you can decide if this product is right for you. It has great features, as well as a bold look. The fact that it is so versatile definitely helps as well. You can start a meal on the stove then move to the oven to finish it off. When you are done, clean up is always a breeze. The colorful finish resists fading and staining as well. Like I said before however, the price is really an issue for me. It might not be for you, and if that is the case then you can pick one up at Amazon.com. However, as it stands, this product is a great find at too high of a price. For this reason, if you are looking for your first enameled Dutch oven, then I can’t recommend this to you. Instead, I would take a look at the Lodge EC6D43 Enameled Cast Iron Dutch Oven. It has many of the same features at a fraction of the price. You can also check out our review, if you are interested. On the other hand, if you are looking for a replacement Dutch oven and have the money to burn then go for it. Well, that concludes our review of the Le Creuset Signature Enameled Cast-Iron 6.75 Quart Oval French Dutch Oven. Thank you so much for staying with us and we hope to see you again in the near future. Have a great day!